An all-new design for all Miller equipped LE and Valiant models in 6V or 12V, positive or negative earth. For 6V or 12V Lucas equipped models see further down this page. The design aim was to produce a highly reliable system in the form of a complete kit of parts for easy fitment by the owner/rider. The system addresses all the issues arising from the ageing OEM coil and contact breaker set up and carries on where the established H. Maidment system is now becoming hard to maintain. 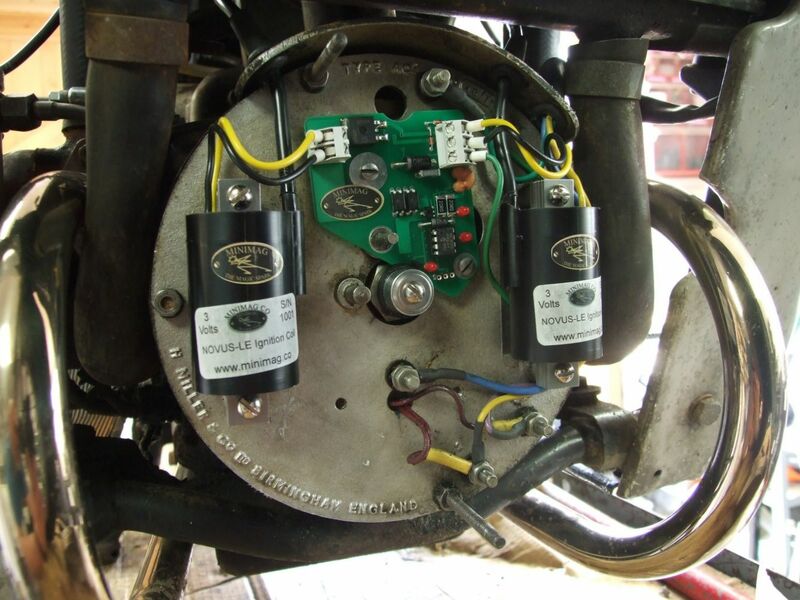 Unlike many other aftermarket electronic ignition boxes available to the motorcyclist, the Minimag VELO8-M is designed specifically for the LE. It is backed by 25+ years of ignition system design experience and motorcycling enthusiasm. Electronic circuit board, two ignition coils, link wire, magnetic rotor with fixing screw and extractor bolt, coil fixing screws, sleeve grommets, two suppressed HT caps, two spark plugs, ignition timing tool, printed fitting guide in colour. Lucas Available in both 6 volt and 12 Volt positive or negative earth versions with timing to suit LE, Valiant or Vogue models. 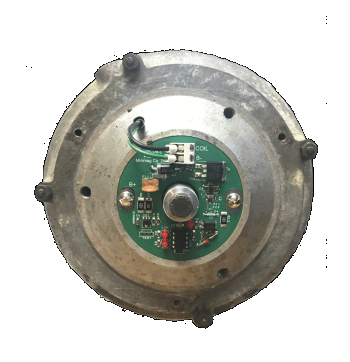 Compact electronic circuit board and magnetic timing rotor fits in place of the original points backplate and points cam / ATU. Works with original style Lucas coils or a twinspark coil. Supplied with full instructions, new fitting screws, plugs, caps and a timing tool. A 12 volt dual output coil. Chromed case and mounting bracket. Dims. 55 dia x 130 height. Supplied with replaceable 500mm HT leads and suppressed caps. £72.68 + £6.00 UK delivery. A modern variation on the original buzz or trembler coil as used on many early stationary engines and some cars. The key difference between a coil / points setup and a buzz coil is that the former produces a spark on contact break, a buzz coil produces a stream of sparks on contact closure. We went one stage further, eliminating the dubious need for a stream of sparks by producing a single very powerful and accurately timed spark. Once a spark has been produced the box goes to sleep until the next cycle, dramatically reducing power consumption. The SS (Single Spark) Buzz Coil contains a purpose-built fully potted ignition coil matched with a highly reliable electronic circuit. There are no moving parts and no wear. HT output is by an easy to use shrouded screw terminal and insulating cover (not pictured). LT input connection by thumb screws. There is a built-in LED timing light to aid setting up and fault finding. The design brief was to produce a highly reliable ignition system capable of many thousands of trouble-free hours operation and return very low power consumption. We have therefore spent the money on fit-for-purpose internals rather than on external appearance. Help and support always available. Just telephone or email. Price each £74.50 including UK delivery.